Gain an in-depth knowledge of fashion and management in a creative art school environment. You’ll be taught by academics with extensive fashion management experience, preparing you for a successful career in this fast-paced global industry. The MA Fashion Management offers the chance to develop your creative thinking, marketing and business management skills while gaining a comprehensive understanding of today’s fashion world. You’ll learn from academics with a wealth of professional experience, and from external practitioners who bring different perspectives on current sector practices and issues. As you’d expect from a Russell Group university degree, your learning will also be informed by the School’s research. This programme offers the chance to choose a specialist module that will help you to achieve your career goals, on topics such as marketing, entrepreneurship or digital cultures. Based within a close-knit, creative community, you’ll be able to take part in School-wide events and collaborative projects with art and design students to enhance your skills and knowledge. Visits to London exhibitions and fashion shows will complement your campus-based studies. You’ll graduate with an impressive skill set that will help you advance your career or set up your own business venture. On the MA in Fashion Management you’ll gain the necessary skills to successfully manage any type of fashion brand, including fast fashion, sportswear, middle market, designer, lifestyle and luxury brands. It will be of interest to students from a creative or design background who want to hone their management skills, as well as those with business or management training who want to gain sector-specific skills and knowledge. This is a one-year, full-time course. You’ll study a number of taught modules during the first two semesters; in semester three you’ll undertake independent study for your final project. Fashion Management modules in semester one and two will introduce you to the core topics and practices involved in the strategic management of a fashion business. You’ll cover areas such as consumer behaviour, creative brand building and development, trend forecasting, supply chain management, product sourcing and development, integrated marketing communications, corporate social responsibility, sustainability and digital culture. In semester two you’ll consolidate your learning and be encouraged to think critically about fashion industry issues. Working in groups, you’ll examine case studies with a focus on topics such as sustainability and strategic brand growth, to apply your knowledge to real-world scenarios. As well as gaining management know-how, in semester one you’ll gain a deeper insight into the fashion industry and its evolution. The Fashion Theory and Context module will help you to understand today’s industry, trends and customers within a broader historical and theoretical context – something not offered on all fashion management MA degrees – giving you a competitive advantage when you graduate. Professional and Academic Skills modules in semesters one and two will ensure you are equipped for success, both in your studies and your future career. The modules include industry-specific activities such as producing mood-boards, competitive shop reports and price positioning maps, as well as collaboration and CV writing for fashion roles. You’ll also learn about research methodologies in preparation for your final project. Throughout the Professional Academic Skills modules you’ll be encouraged to reflect on your personal and professional goals and identify steps that will help you to achieve them. This programme offers a higher level of personalisation than you’ll find on many similar UK degrees elsewhere. You’ll be able to tailor your course by choosing an optional module in semester two. This can help you to achieve your career aspirations – for example if your aim is to set up your own business you could take the entrepreneurship module, or specialise further in areas such as digital marketing, responsible design or advertising management. If you have come from a management background and would like to study a creative topic in more depth, you could choose a module on visual cultures or the theories and practice of visual presentation. The final project is another opportunity to personalise your degree, as you’ll be able to choose a topic that aligns with your career goals. With academic supervision you will formulate a proposal and conduct your own research, using primary or secondary sources, to produce a report and presentation. Past students’ projects have covered topics such as a comparison of the luxury markets in China and the UK, consumer trends in specific geographic regions, and issues relating to sustainability in fashion. Our academics bring extensive industry experience and research expertise to the course. Their research strengths and areas of specialist knowledge include fashion in emerging markets and global contexts, the British fashion industry, global supply chain and design management, and sustainability in fashion. Programme leader Dr Lipi Begum has professional experience in fashion retail, social enterprise and trend forecasting, and has consulted for the United Nations, universities and industry in Bangladesh, Paraguay, Uzbekistan, India and China. Her research explores ways in which fashion marketing and management intersect with cultural contexts and sustainability. Charlie Ellis has worked in the fashion industry for more than 30 years, including roles in Hong Kong and China, and has taught at a number of London higher education institutions. Molly Mills has over 20 years’ industry experience, including senior design and design management roles at Full Circle and Fat Face. She has particular expertise in design, logistics and supply chain management, and has set up her own label and shop. Her interests include sustainability in fashion, ethical supply chain development, design management and brand management. Dr Adam George Dunn’s extensive research experience informs his teaching of academic and research skills. His research focuses on the way in which fashion and luxury can contribute to individual and collective expressions of identity. Gain industry-specific management skills and a comprehensive understanding of the contemporary fashion world, including its historical and cultural contexts. Learn from academics with extensive fashion management industry experience and research expertise. Personalise your course; choose from a range of optional modules and tailor your final project to suit your career ambitions. Industry speakers and visits to London galleries and fashion shows will enhance your learning. Based in a creative art school environment, with opportunities to collaborate with fashion and textile design students. Graduates have gone on to work for Seiko, Longines, Burberry, Arcadia Group and Longchamp. The admissions policy for the MA Fashion Management is based on students having a good honours degree in a relevant subject (2.2 or above) or an equivalent standard in other qualifications approved by the University. The MA Fashion Management will prepare you to start your entrepreneurial venture or join the fashion industry at management level. Potential roles include fashion buyer, stylist, fashion product developer, fashion merchandiser, fashion sourcing or brand manager. Or you could become a supply chain manager, marketing consultant, retail manager or public relations manager in the fashion industry. This degree is also excellent preparation for further study at PhD level. The course is delivered through a combination of lectures and seminars, plus additional independent and group study. The seminars are highly interactive with lots of group activities, such as case studies and presentations, to help you apply your learning to real-world scenarios and develop essential transferable skills. Industry guest speakers will further enhance your learning and optional field trips to London in semesters one and two will complement your class-based studies. Recent destinations have included the Victoria and Albert Museum and London Fashion Week. You’ll be assessed through course work including individual and group assignments, presentations and critical reflective reports. The School has a superb library with a range of materials tailored to the study of fashion management. You’ll also have access to Mac suites with the latest industry-standard software, as well as learning resources available through Blackboard, our virtual learning environment. These include video recording and streaming platforms and access to lynda.com, which hosts a wide range of online tutorials for additional professional skills development support. 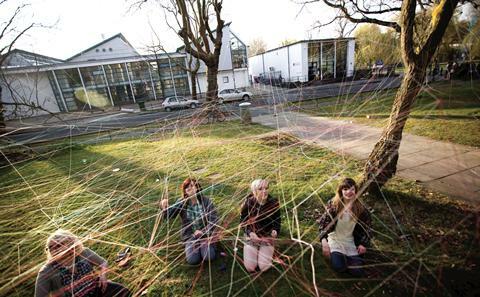 Winchester School of Art is a supportive learning community with an approachable, friendly academic team who will help you to achieve your ambitions. You’ll have one-to-one tutorials with your personal academic tutor, who can advise on any queries relating to your studies. You’ll also be able to access a wide range of University learning and welfare services should you need them. For international students, weekly English for Academic Purposes workshops will help you to advance your language skills and understand the requirements of academic study in the UK. One-to-one English language tutorials are also available.